Banff, Alberta is filled with fun activities, tours and events that cater to groups of all sizes and purposes visiting the Canadian Rockies. Take advantage of the array of activities available by holding your next corporate getaway, training exercises, or group gathering in Banff National Park. Enjoy the recreational beauty of the Canadian Rockies with tour packages offered by Banff Travel. Build stronger teams by taking part in wilderness activities such as white water rafting, lake cruises, horseback riding, scenic bus tours or zip line tours. Depending on your group dynamic, Banff National Park can cater to whatever your group desires. Banff Group Tours – Groups of all sizes and dynamics will enjoy time in the Canadian Rockies wilderness. From sightseeing tours to gondola rides, there is something for everyone. 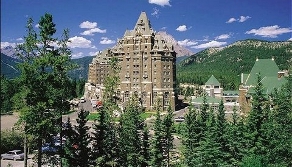 Corporate Meetings – Mix business and pleasure by planning your next corporate function in Banff National Park. Choose from great locations to hold a corporate getaway or business meeting. Corporate Planning – The Canadian Rockies is the perfect place to develop corporate leadership and team building strategies. Use Banff as a place to inspire creativity and productivity in your business.